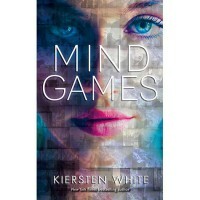 Originally posted on my blog:http://vanillamoonblog.com/2013/04/08/review-mind-games-by-kiersten-white/actual rating: 2.5I’m not very sure what I was exactly expecting when I started this book, but I received a totally different thing from what I imagined. Firstly, the book has two main characters – the sisters – and we get to read the story from both of their perspective… in a double first person narrative. Some chapters are from Fia’s point of view, others from Annie’s. It sounds confusing, and it is… at first. It took me around a third of the book to get used to this way of telling the story.Fia’s mind… I found it tricky to understand. I initially thought the tap tap tapping and word word word repeating were just the author’s way of writing. It was annoying and hard to enjoy, but after that third of the book, I understood it was just Fia’s way of thinking. Her mind is confusing and her thoughts are sometimes inconsistent because she is trying very hard not to let anyone read her mind and anticipate her plans. Because that’s what the book is actually about. It’s a mind game with Readers, Feelers and Seers – and whatever Fia is, as nobody knows that yet. I’m not very sure I bought the fact that you can hide and alter your feelings and thoughts completely all the time though.Annie’s mind is more relaxed, more focused, but also depressing. I found the crossing from one sister’s point of view to the other’s too abrupt. It was also tiring to keep reading how they are blaming themselves for a tragedy they couldn’t have stopped from happening. I understand their guilt is natural, but there was no reason to keep mentioning it so often.The romance was present, but not as you would expect it. Fia is in love with the son of the school’s founder (aka the one who ruined her life), so she keeps fighting against her feelings, but she always ends up in his arms somehow (don’t they always do that?). At the same time she wants to have a normal life and be with Adam, whose life she saves, but she doesn’t allow herself to have him because she has done some “terrible things”.The story itself turned out to be enjoyable after all. There was a moment when I thought of dropping it and starting another book, but I got back to it and finished it and I don’t regret my decision one tiny bit. As I mentioned, after getting past one third of the book, I got used to the writing style, the characters and the plot, and from that moment, it was a somewhat entertaining ride. The book had the potential to be something amazing, although the concept that started it wasn’t unheard of. If it wasn’t for Fia’s incoherent thoughts (which made the book to be incoherent too), I know I would’ve loved it for sure. I will probably read the sequel too, in hope to see an improvement, and hopefully character development.